Are you looking for a thrilling idea for your child’s birthday? Dancercise parties will get your children moving & shaking to the latest pop & dance tunes and learning a personalised dance routine. Lots of games, dancing and hula hooping competitions, props and toys, face painting and much more! 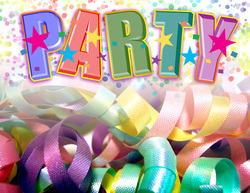 ​1 hour of party fun with one of our Dancercise party hosts costs only £75! Organising a party for a special occasion? Would you like to get all your guests dancing and boogieing? Dancercise also offers dance entertainment to suit every type of celebration, like weddings, hen and stag nights, birthday parties and much more. Get in touch for more information! "Thank you for the fantastic way you handled the party booking for my daughter Mia. You were very informative and friendly from the start which gave me confidence in your ability to make the party memorable. Mia and her friends loved the party and are still talking about it!..it was fantastic and made Mia's day. She described it as a 'fun packed' party.